With sweet musk-roses and with elgantine." 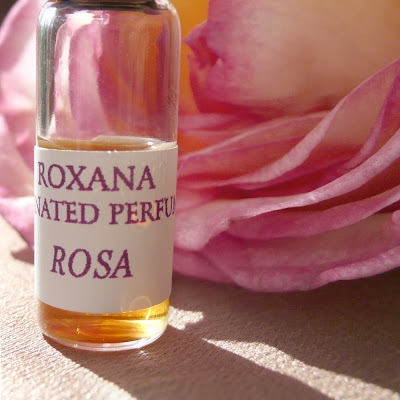 Today blooms in Rose with the botanical perfume Rosa, named after the California native wild rose. Of all the flowers that grace our lovely blue planet, no other is featured in poetry and literature like the Rose. With her rich historical references and varied personas she continues to enchant. The main notes in this dark and luxurious floral perfume is a woven heart of Turkish Rose otto, Indian Rose absolute and a complex accord of Rose. The heart is anchored by the resinous, musky Agarwood and earthy Vetiver. Her top note accessories are mainly in the citrus family. Off to write about Rose and handmade bath & body products for the ECGC (Etsy Clean and Green) blog.